 Williams, a pseudonym for John Miles (A Permanent Retirement, 1992, etc. 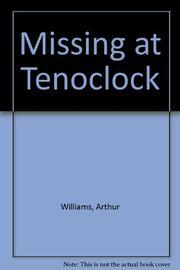 ), tells a tale of Tenoclock, which has been named Colorado's newest tourist-celebrity boomtown but where, still, Deputy Sheriff Jonelle (Johnnie) Baker can usually close the police station before midnight. Then the Sheriff is hit by a train. Was he simply drunk, or was there some foul play involved? Johnnie thinks the Sheriff's death is tied to a missing-persons case, and now witnesses are disappearing. Clues point to the exclusive Sky Estates and the famous, reclusive movie star Brandon Warner. Johnnie finds two bodies in an abandoned mine, but the exit has been booby-trapped and she plunges into the lower levels with little hope for escape or rescue. The resourceful Acting Sheriff finds a way out, only to be confronted by another life-and-death situation, along with a mayor and county commissioner who will do almost anything to avoid bad publicity. For all of its glamorous visitors and vivid townsfolk, this trip to Tenoclock is more skillful than exciting.